Whole Fig Preserves made without lemon juice to retain their natural hint of peach flavor. Delicious served chilled on hot Homemade Buttermilk Biscuits or buttered toast. Serve on a slice or wedge of one of your favorite, non-frosted Old Fashioned Cakes, topped with Homemade Whipped Cream. Yummy! 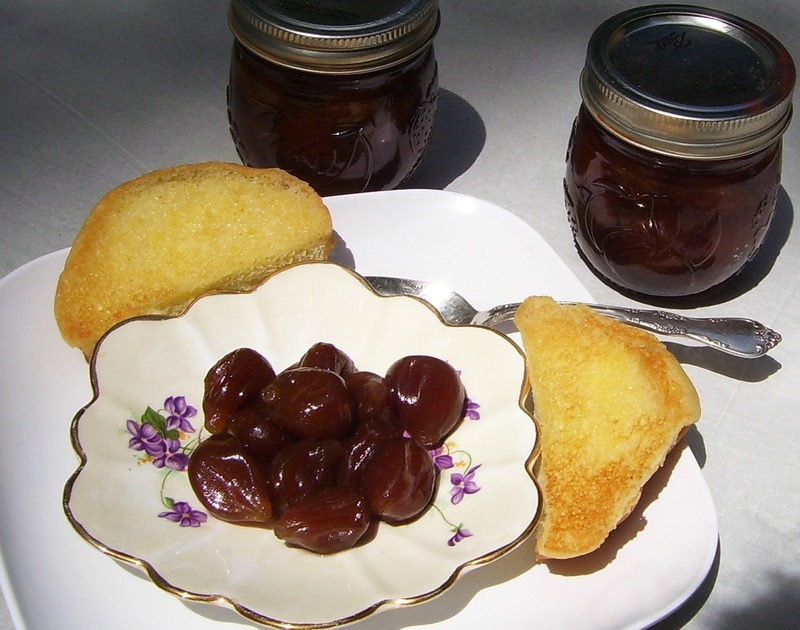 Make this old fashioned Fig Preserves Recipe for your family and friends to enjoy. Pack them in small 1/2 pint decorative jars for unique, gift giving on special occasions and holidays. Rinse figs with water clean away any debris. Using a paring knife, cut hard stem away and discard. You may notice milky substance oozing from the cut. (Don't worry the substance will stop when you pour the boiling water over). Place figs in a large bowl. Pour the boiling water over and let rest 15 minutes. Handling gently so as not to crush figs, rinse in cold water. Combine the 4 cups water and sugar in a large sauce pan. Stir on medium heat until sugar is dissolved. Let come to a rolling boil. Boil 10 minutes. Take off heat and remove foam if any, from top of pan using a soft spatula. Drop figs, a few at a time, carefully into boiling water. Use a long handled ladle or spoon so as not to get burned from the hot steam and keep the figs intact. Place pan back on medium heat. Don't let the syrup stick or burn on bottom of pan. (The rapid boil helps plump your figs. Just when they have turned colors and are transparent looking, remove from heat. Bring syrup back to a boil and cook until thick. It should be about as thick as pancake syrup. Remove from heat and pour over figs making sure they all have some syrup over them. Let set 6-8 hours. (I prefer to let them stand overnight at room temperature). You will need an accurate thermometer. (I use a candy thermometer). Place them and the lids and bands in a canning pot of cold water. Turn on heat and bring temperature to 180F. degrees. Maintain this temperature for 10 minutes before filling with preserves to prevent jars from cracking and breaking due to shock. Leave them in the hot water until ready to use. Put figs and syrup back in saucepan on stove and bring to a boiling point. Remove one jar from water in canning pot at a time and ladle the preserves in. (A canning funnel is excellent to prevent syrup from dripping all over the rim). Fill jars leaving 1/4 inch head space. Wipe rim and edges with a clean, damp linen cloth to remove any particles of figs and syrup. Place lids on rim of jar, adjusting to center the sealing compound on the rim. Otherwise it may not seal properly. Place band over lid and screw on just until it is firm, but not tight. Do not screw band on as tight as you can get it. (I learned the hard way by breaking a few jars). It will tighten during or after processing. Place jars on a canning rack as you fill them. When all jars are filled lift the entire rack of jars and place in the canning pot which has maintained the 180 F. temperature. Of course, if you are physically unable to lift this many jars or it is too heavy for you, stay safe and put the rack into the water and place the jars as they are filled into the water, using a jar lifter. Turn heat up and and bring water to 212 F. degrees. Adjust heat to medium as necessary to maintain this steady temperature for 10 minutes. Turn off heat. Let set for 5 minutes. Carefully remove jars to a counter top or cutting board covered with a cloth towel. Check bands to see if any have loosened. If they have, using mitts, firmly tighten them as before. Again, not as hard as you can. You should start hearing each jar pop soon after removing from canning pot. That popping sounds as the jars vacuum seals. (Occasionally, you may not hear the sound). Leave your jars of preserves out on the counter for 24 hours to let them cool thoroughly, giving them all time to seal. You may find some jars will seal later than others. Makes about five 1/2 pints. Happy Canning! Now, enjoy your Homemade Fig Preserves!